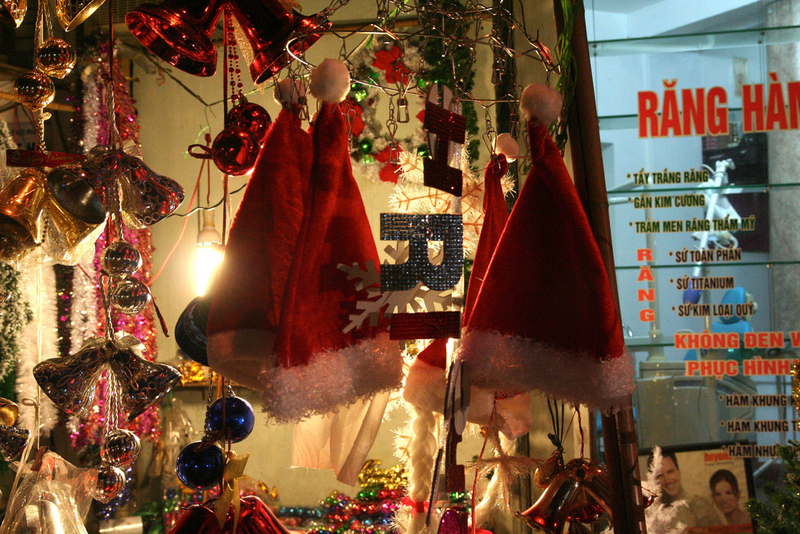 Street Sweets for Tết… who needs Christmas? 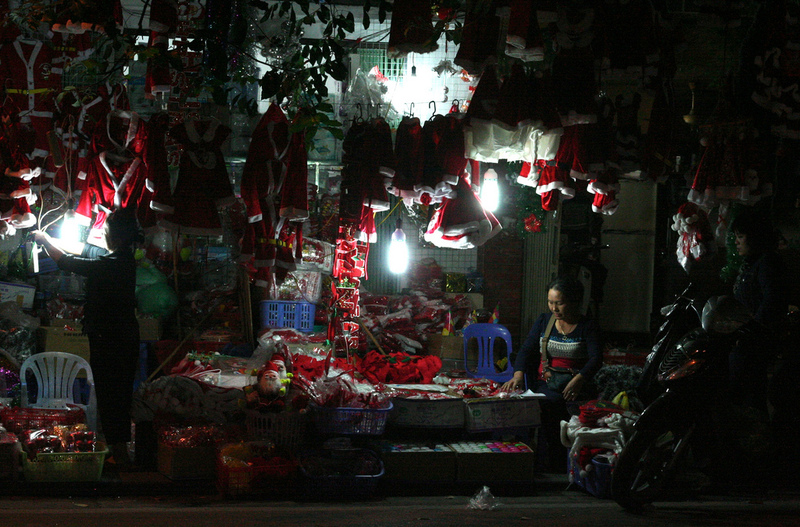 Christmas in Hanoi, so far, is the occasional bony Santa-mannequin (the one on our street plays a saxophone! 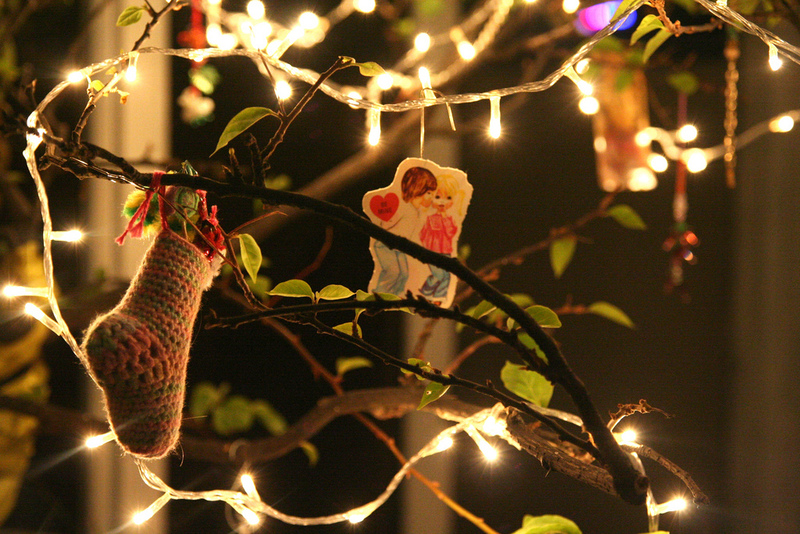 ), the odd waft of warbled carols heard like hauntings every few days, and in the expatriate shops at least, a lot of the same cheese that happens at home, but that only serves to remind that I don’t have to do any shopping this year – miraculous, no? I’ll have the evening to phone my family, make apple crumble and martinis for me and the bf, order in some fancy sushi and be quite happy with that. But, if I’m lucky, I might chance on another sweets seller on the street between then and now, and that would mean some genuine child-like squee-ing for a bit of bonus Viet-style cheer. 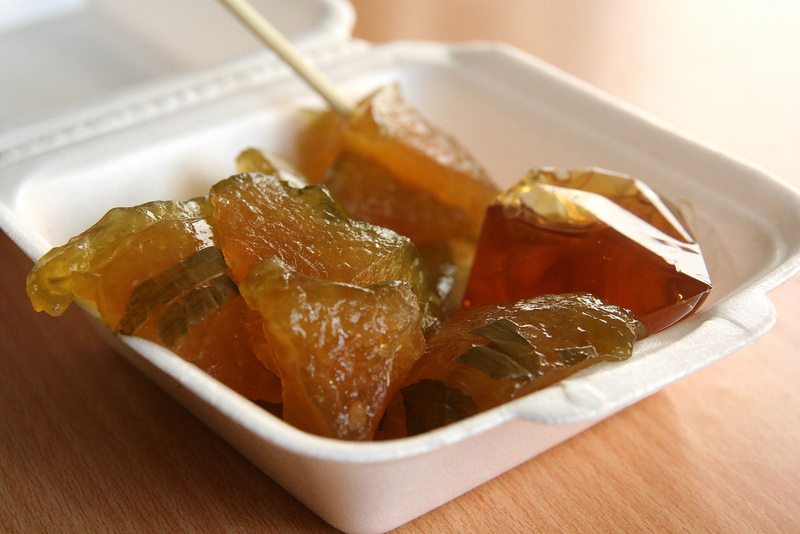 As strange as these cakes may look, if you’ve had asian sweets before and you’re familiar with the gelatinous texture of them, then you’ll really be in heaven with a spread like this. Maybe the most accessible (or not) is the chè con ong, (aka tea bee, if Google translate is at all correct). 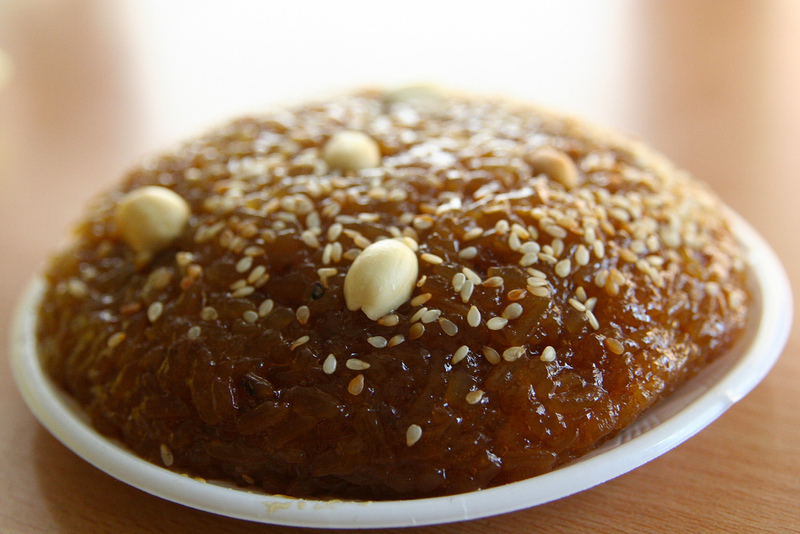 It’s an incredibly sticky rice disc, and while I don’t think there’s tea or honey in it, what it does have is a deep burnished almost-caramel flavour spiked with sharp ginger and reads rather properly as gingerbread. It’s perennially popular here around Lunar New Year, and some strange sort of flavour/calendar crossover with the western classic, which amuses me. 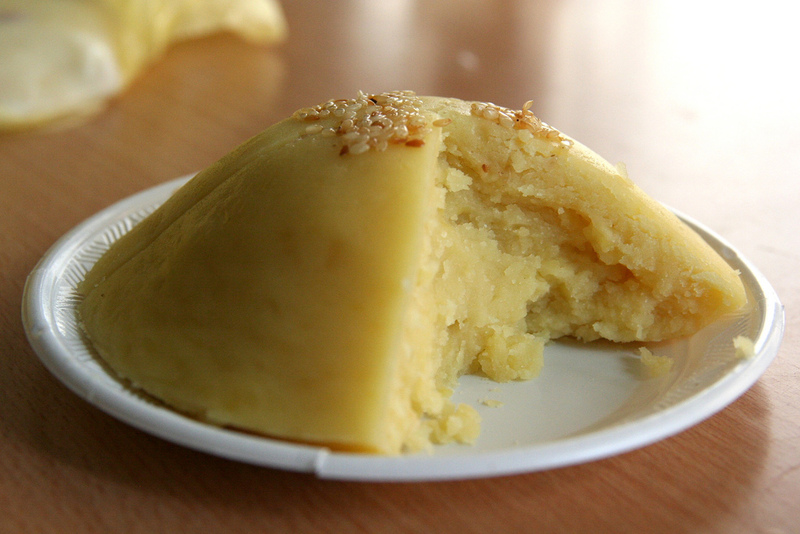 Like night and day, heavy and light, this un-identified wiggly cake is … now identified as bánh đúc! It’s made from either non-glutinous rice flour or corn flour (this one is rice), with a soft texture and mild flavour. I dig it. 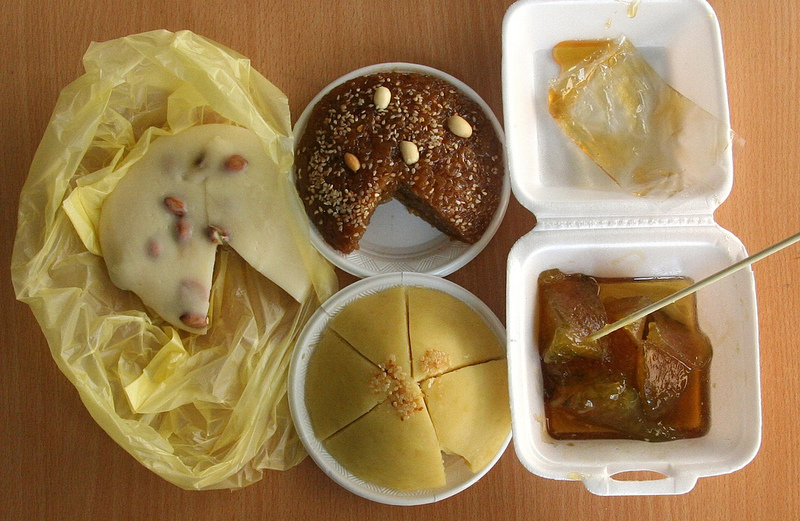 Back to the rich side, if you’re into shortbread, you might like mung bean cake, or bánh đậu xanh. It’s fudge-dense and sweet and mild tasting, and it stole my heart so neatly that there is in fact a box of it sitting under my Charlie Brown tree and I might have to steal a few pieces from the giftee. Chief ingredients are mung bean powder, coconut milk and sugar, and it’s not uncommon to find the same combination in the middle of mooncakes. Needless to say, it’s good with tea. Lastly, the most mysterious of the bunch was – until the point of selling – wrapped in a pandan-leaf bundle and tied like a present, and since I’m always curious about things like that, it was the first thing I selected. On purchase, however, the woman unleashed the jiggling interior, snipped it to pieces and bunged it all into a styrofoam container with a tiny baggie of cane syrup and an oh-so-handy wooden spear. That’s not even the mysterious part. What’s got me scratching my head is that although it feels and tastes like a normal gelatinous rice substance it smells intensely eggy – almost in a way that’s off-putting, although I happily finished it, owing to a perverse kind of attraction to strange foods. Anyone know what this is? I’ve never gotten into Asian sweets…I think I’m too Germanic, but I like the rundown you’ve given a few! Mmm, I miss germanic sweets, too, though – the cakes alone are better than any cake I’ve had on this side of the world. Actually, do you have a any recommended recipes for stuff like that? Yay job! And super yay not having to buy any presents. We’re going to Michigan for holidays, so we can’t make any present-buying progress unless we want to carry everything on the plane…ugh. I’ve never had any Asian cakes like those! Maybe I’d better spend some time at our local Asian bakery–although I’m pretty sure it’s mostly actual cake & bread (& egg tarts) there. In Singapore we have a type of sticky rice cake – ‘Nian Gao’ encased in a pandan leaf (Tartlike) which we keep till it becomes quite hard long after Chinese New year. Slice it up, dip in batter and dip fry to a crispy exterior and gooey sweet interior. Or add a slice of Yam/Sweet Potato with rice cake prior to frying. Yum.